It’s an absorbing political thriller and feels like a stage adaptation of a television series, something like Homeland or The Night Manager. Director Janet Steel keeps things theatrical with simultaneous scenes on stage at various points, using sparse scenery and atmospheric lighting to evoke the bigger picture, the city outside the rooms we visit. As handsome hero Tariq, Robert Mountford is an appealing lead, stricken by external and internal conflict. 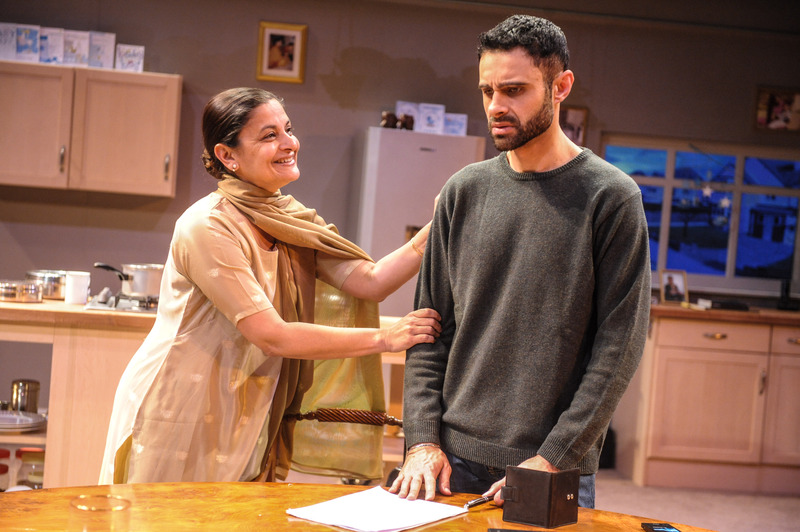 As his beautiful wife, Goldy Notay matches him for humour – the volatile dialogue sparks between the couple, and the naturalistic playing rings true. Also remarkable is Ahmad’s ear for male banter within the context of the undeniably macho genre of the espionage thriller. Neil D’Souza is excellent as Tariq’s superior, Brigadier Chaudrey, while David Michaels is both friend and foe as CIA man Lowe – epitomising the personal/political tensions of the piece. Maya Soraya plays the doomed prostitute and her sister, bringing vulnerability and fear in some striking scenes, and there is enjoyable support from Zaqi Ismail as the blunt Captain Gul. Jai Channa’s music provides an emotive soundtrack, underlining the cinematic or televisual aspects, but is used inconsistently. All or nothing, I’d say. What it comes down to is the question of how far will one go, what compromises will one have to make, and how to live with the consequences of one’s choices. We see Tariq painted into a morally complex corner – he runs out of options. What will he sacrifice – his status or his personal integrity? Gripping, intelligent and classy, The Dishonoured is an intriguing piece, excellently presented by Kali Theatre.